Phase-one of the International Sliding Sports Museum at the Olympic Sports Complex at Mt. 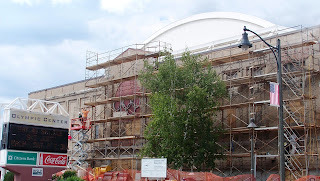 Van Hoevenberg, in Lake Placid, is scheduled to debut this summer. 2012 world bobsled champion Steven Holcomb (center) was presented with a copy of his “Legends of Mt. 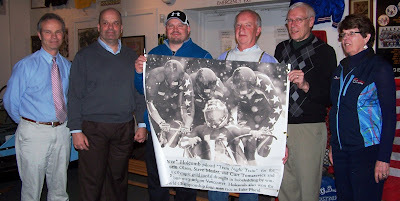 Van Hoevenberg” poster during a ceremony held last Wednesday, at the Lake Placid Olympic Museum. The poster is part of the legends project, which was unveiled during the FIBT World Bobsled and Skeleton Championships, held in Lake Placid in February. Billed as the first of its kind anywhere in the world, the museum will feature the history of the sports of bobsled, luge and skeleton and will also exhibits tracing the evolution of equipment and sections of past and present sliding tracks with a display explaining how those tracks were built. Plans are being developed for a historical walking tour of the 1932/1980 track and the new combined track with informational signage creating a self-guided exploration of the venue. Organizers hope to build a comprehensive sliding display that will include historic race sleds, equipment, video, photographs, medals and trophies. 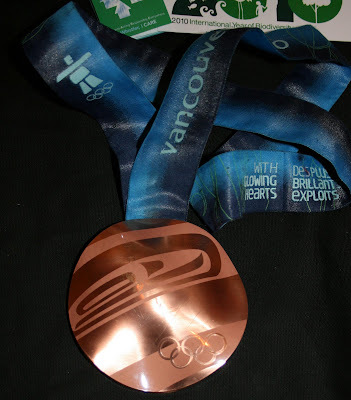 Several of these items are already on display at the Olympic museum. Photo: Steven Holcomb (center) with (L-R) Ted Blazer, ORDA president/CEO- Jack Favro, associate director of Lake Placid Olympic Training Center- Joe Lamb, community organizer- Craig Randall, Village of Lake Placid mayor- and Mary Lou Brown, chairman of the Lake Placid Olympic Museum.